This edition of the Modern Day Map Tiles pack is designed for use by Game Masters who love building their own maps, and want access to a toolbox of ready-made artistic material rather than the hassle of designing their own material from scratch. The map tiles within this package were designed to act as library of art assets that a Dungeon Master could simply just drag-n-drop onto a canvas to form a map. Using map tiles permits very granular control over the form of your dungeon chambers and passageways, rather than relying on pre-constructed rooms which you cannot change. 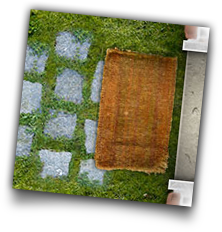 Once the structure of the map is in place, add the final touches by dressing your map with props and object tokens such as tables, chairs, statues, etc. A map tile - in the context of this set - is square of artwork depicting a specific 5ft by 5ft area of terrain. Such as the floor of an office, an area of street sidewalk, or where the floor meets a wall. 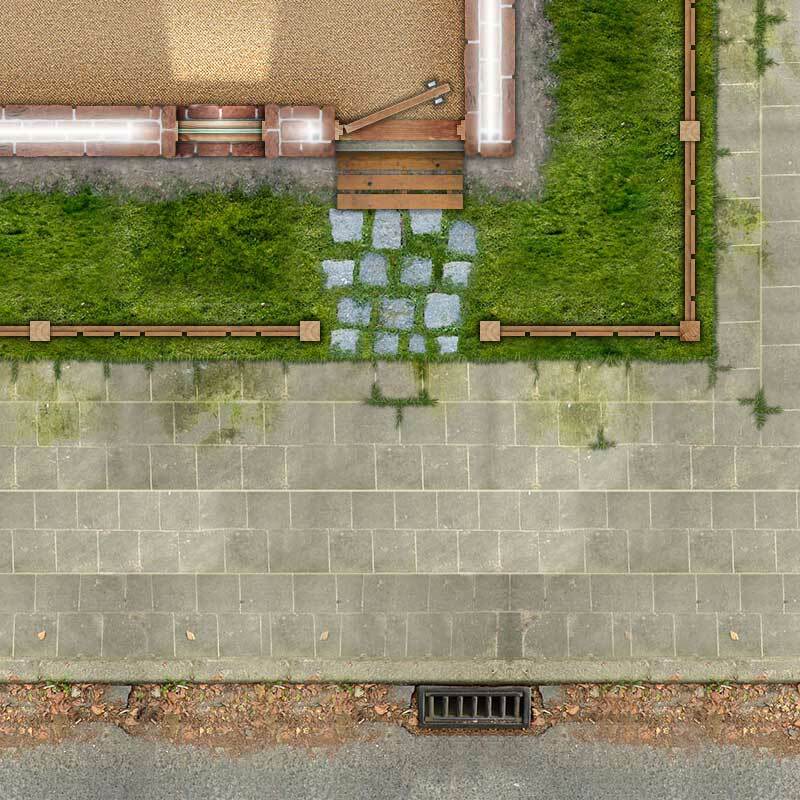 In order for a Game Master to build an adventure map for players to explore, map tiles are placed onto the digital canvas one by one until the desired urban setting is constructed. Be that terrain an area of street, a Cafe, an office, or secret corporate bunker. The map tiles have been made as a kind of ready made art pack that you can simply just drag'n'drop onto a digital art canvas to build a map. 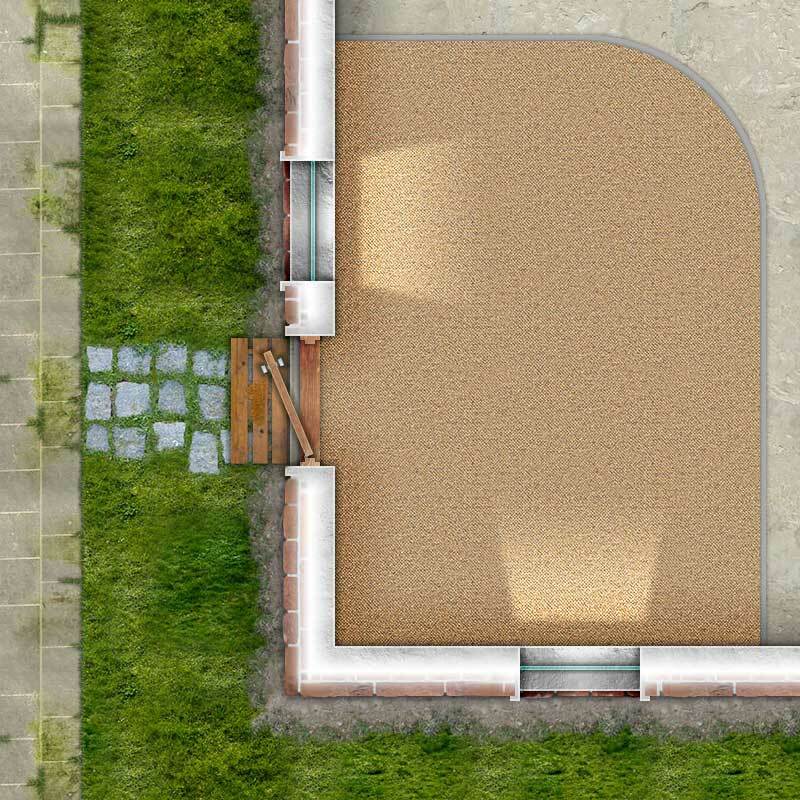 To do this all you need is a graphics editing program such as Photoshop, Gimp, or another Map Making program that will permit you to use pre-created tiles to build maps. We recommend using Gimp, it is free and is a very powerful program for this task. If you are not sure about what to do, we have a tutorial about building your own maps which is included in the zip file. This set of map tiles was designed from the beginning to expand on the range of map tiles found in our Dungeon Map Tiles set (plus the Dungeon Map Tiles II Set, and Cave Map Tiles Set). Now you don't need the other map tiles sets to use the Modern Day Map Tiles set, but we recommend getting both so your players can explore an urban environment or an ancient dungeon! Below are four sample mini-maps built with the Modern Day Map Tiles pack. "This is the first modern themed set of map tiles I designed, in the future I would like to make some more industrial themed map tiles and maybe even some military bunker style map tiles. Thank-you for taking the time to review this product. It is support from people like you that enables me to continue bring you such products." Build unlimited adventure enviroments with these map building resources from Studio WyldFurr. Found a neat little way to make this awesome pack even awesomer. You may find that the concrete/carpet floors get a little samey after a while. Well, have no fear. 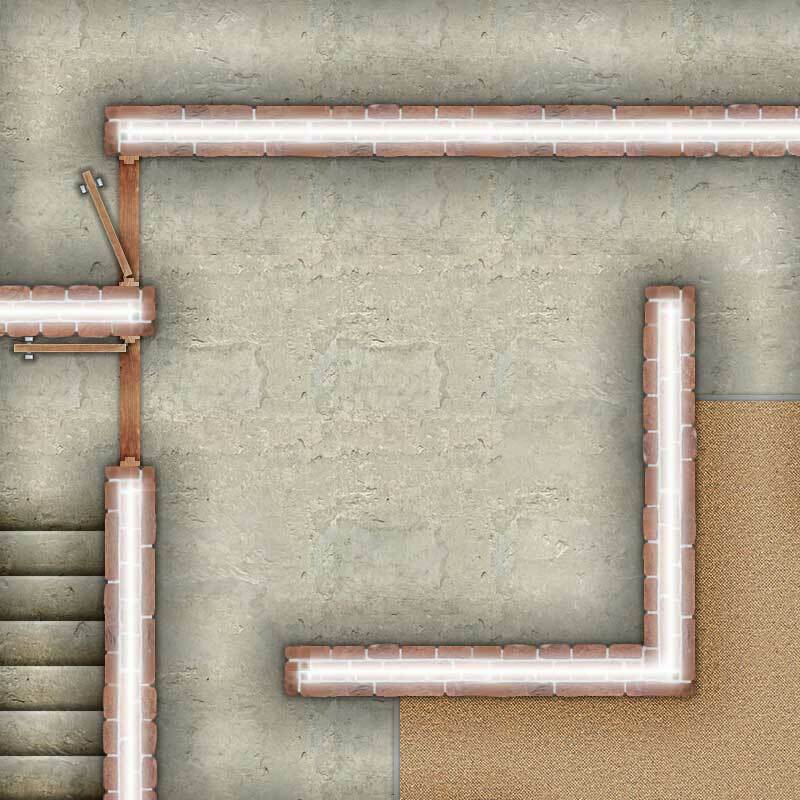 It's easy to make your own by resizing an appropriate seamless texture to 180x180. 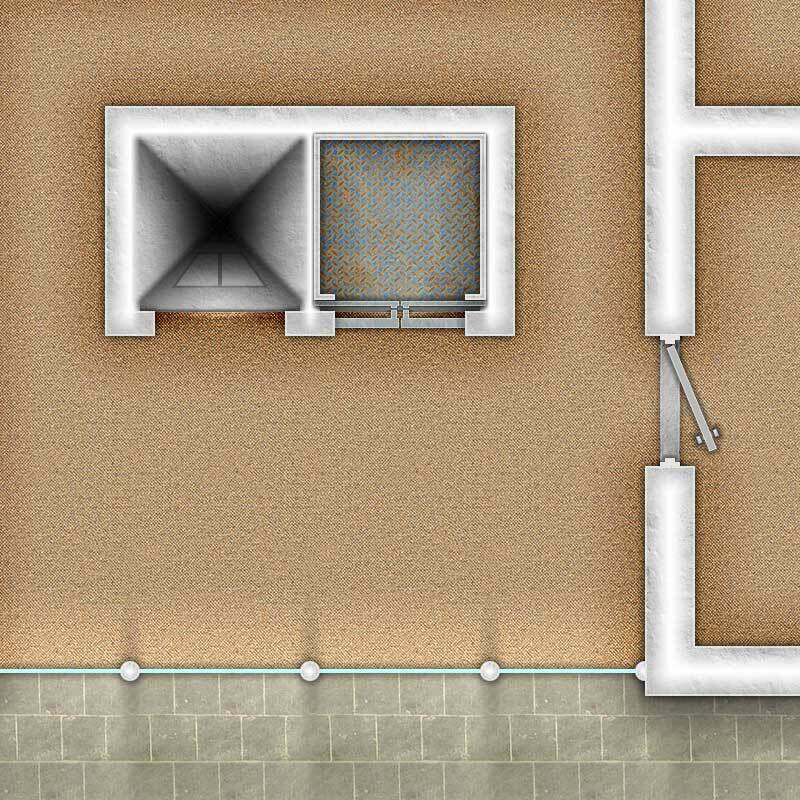 Walls can be easily added around it by using the External walls/Plaster Upper Level or External walls/Brick Upper Level sets, whose shadows have a gradient transparency, making them simple to overlay on top of custom floor textures. Great work, just about to leave a glowing review. My version of Photoshop (CS2) seems to want to open the tiles as a separate image, which then has to be cut-and-pasted into the template, but other than that, it's all good. Older versions of Photoshop might not have the "place linked..." or "Place Embedded..." functionality. What I do is drag'n'drop images from a File Explorer window into the open map image I am building. In my version of Photoshop they are placed as a "linked" image. But older versions should place them as a separate layer. Or you could just grab GIMP as it places dragged images as new layers. But whatever method works best for you. Hello! It says there is a Sample Sheet to download so I can see all the tiles. However, I do not see where to download it from. Any ideas? Thank you. :) Are there roads with white/yellow lines in the middle? Mainly for a downtown map. Thanks! The roads don't have stripes down the middle because that is where the split between tiles is. But what I have included in the last update are some token stripes you can place on the roads when map building.